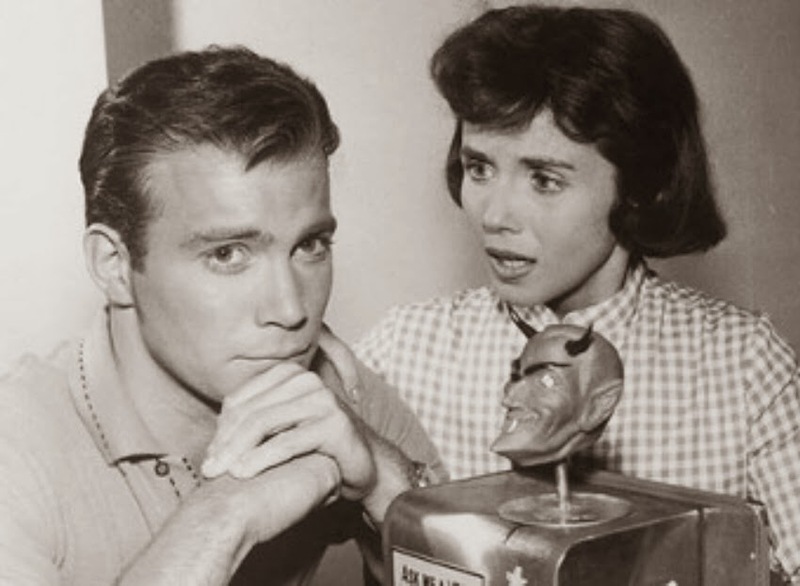 John Kenneth Muir's Reflections on Cult Movies and Classic TV: National Twilight Zone Day: "Nick of Time"
"Nick of Time" is a Richard Matheson story, and one of my all-time favorite installments of the 1959-1964 Rod Serling series, The Twilight Zone. There are flashier shows, there are scarier shows, but I really enjoy how ambiguous this story is. "Nick of Time" is the story of Don S. Carter (William Shatner) and his new wife, Pam (Patricia Breslin). Their car has broken down on their honeymoon trip to New York, and the couple is forced to make a pit stop for repairs in the sleepy little town of Ridgeview, Ohio. It is there, in the Busy Bee Diner, that this couple will -- according to narrator Serling -- find "a gift most humans will never receive," the ability to "learn the future." Why? Well, because this town and this diner rests on "the outskirts" of The Twilight Zone. Our central character Don is an interesting guy, and Shatner's performance here is one of his best. Don's the superstitious type, with a rabbits foot on his key chain right beside a four-leaf clover. He is given to expressing himself in phrases such as "keep your fingers crossed." "It's like you married an alcoholic" he admits to Pam in one of his more lucid moments, aware of how superstitious he really is. First, the machine accurately predicts that Don will get the promotion he's been waiting for. Then it reports that the couple's car will not take four hours to be repaired, as was told the couple. Don grows ever more convinced that the "gizmo" is actually telling him his future. "Why was it so specific?" He asks Pam. "Every answer seems to fit," he insists. And then things get really spooky. Don asks the machine if something will happen to the couple if they leave town. The answer: "if you move soon." He then asks, "should we stay here?" The answer: "that makes a good deal of sense." Finally, Bob interprets a message from the Devil Bobblehead to mean that he and Pam shouldn't leave the diner until after 3:00 pm that afternoon. Convinced and stubborn, Don returns to the diner and begins asking the Mystic Seer more questions, even though Pam begs him not to. "You made up all the details, and all that thing did is give back generalities," she tells him. He still won't leave. Not until his new wife tells him that the machine is running his life, and that she can't be married to a man who "believes more in luck and fortune" than in himself. Don and Pam escape this trap, what Serling terms "the tyranny of fear and superstition," but in the episode's final shot, we see that another couple isn't so lucky. "Can we ask some more questions today?" They ask the machine. "Do you think we might leave Ridgeview today?" 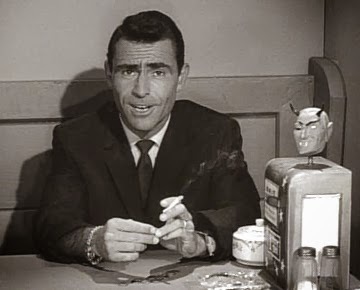 So again, in the most wonderful and entertaining terms imaginable, The Twilight Zone has presented us with a morality play of sorts, one about human nature. Yet what's so enjoyable about "Nick of Time" is that we don't know whether Don is right (and the Devil machine is predicting the future), or if, in fact, he's merely superstitious and all the right answers are mere "coincidence" as Pam suggests. The ultimate point is, I suppose, what you choose to believe in: fear or hope. You can choose to believe that you are small and in danger; or you can take control of your life and face the hardships with strength, and with the ones you love at your side. Beyond a fortune telling device that may or may not be supernatural, there is no overt fantastical element in this installment of the Twilight Zone and yet it is oddly effective, and affecting despite this fact. Visually, it's assembled in clever fashion by director Richard Bare. The first shot of the episode is a wobbly view from a tow truck bed, looking down from a high angle at the car being towed, with Don and Pam inside. This is an important view, because it establishes right from the beginning of the episode that Don is not "driving" his life (nor his car). He's simply being pulled in one direction or another, towed by his fear and superstition. Later, when the couple first enters the Busy Bee Diner with the Devil Bobblehead/Mystic Seer, the camera views Don and Pat from the far side of a lattice-work room separator/divider, a sort of visual frame-within-a-frame signifying entrapment or doom. This same camera set-up recurs at several important moments in the show. The first time, we view two other local residents in thrall to the Mystic Seer at the dining booth, also through this "entrapment" lens (the criss-cross frame of the lattice). Finally, when Pam encourages Don to summon his inner courage, the shot has changed to reflect their strength. The lattice wall is no longer between camera and character -- a visual obstacle and blockade -- but rather behind the characters. They have escaped the trap. They have moved literally past it. I also get a kick out of the extreme (and I mean, EXTREME) close-up shots of the Devil Bobblehead, always jittering ever so slightly but nonetheless playing his Satanic cards close to the vest. He's an interesting villain because he's inanimate and yet we "impose" some sense of fear or personality on him. If it were just a napkin dispenser, minus the Bobblehead, this episode wouldn't work nearly so well. Shatner's performance is so good because he plays a character suffering from a lack of confidence. That's funny, given that he's the guy who plays Captain Kirk, but I would argue that even there, in Star Trek, that's the quality that makes the character work so well. 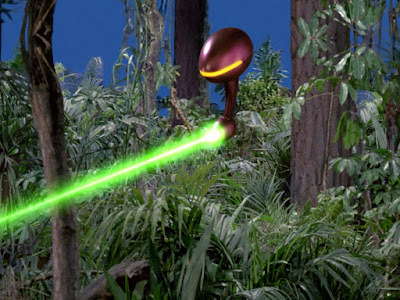 Kirk is a human being, a leader of men, but he still second guesses himself ("Balance of Terror") or fears losing his job ("The Ultimate Computer"). Watching early Shatner performances you get a sense at how deft the actor is in playing a likable yet vulnerable character. He doesn't quite reach the heights of hysteria in "Nick of Time" that he would achieve later in "A Nightmare at 20,000 Feet," but the script calls for different things. I really like Shatner in this kind of every man persona. To me, he represents the perfect 1960s young male: a self-aware, intelligent, resourceful, JFK-type with just enough self doubt and neurosis to make him thoroughly disarming. 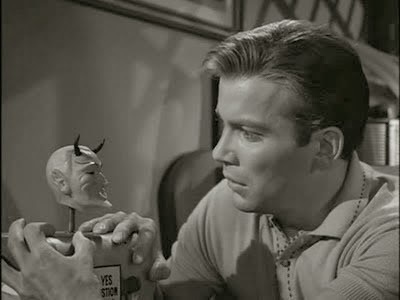 I find it fascinating that Shatner's two Twilight Zones and one Outer Limits ("Cold Hands, Warm Heart") place the actor in the thick of a couple relationship in crisis. He's always playing a husband dealing with something terrible, and trying to convince his wife that he isn't insane. Gremlins on planes, Venusians on "Project Vulcan," or a fortune telling machine that may be the Devil Himself.